A bargain hunter? A trend trailblazer? A comfort lover? A stylish sista? A rock ‘n’ roll fashion rebel? A shoe addict? Those are the qualities that Sarenza are looking for, as one lucky blogger has the chance to become the next Sarenza Ambassador! Here is my entry! Introducing one of the most beautiful, versatile shoes I have come across in a long time. Meet Jeri, from ‘I Love Shoes‘ at Sarenza. Jeri is a stunning shoe boot with impressive stats. A 13.5cm heel, a 3.5cm wedge, £58.70 in price, and a colour combination of rust, tan and grey. A great year round shoe with Autumnal tones that will see you right in Summer too. Pretty amazing, yes? Sadly these won’t by gracing my feet anytime soon as the only size left in stock is 6.5! I think their a great alternative to styles such as JC Litas, and more affordable. I could imagine these working well with an array of outfits. Anything from chinos to floaty dresses, and I’d love to clash another colour with them such as jade green or cobalt blue for a twist. I’ve styled them up ‘a la Sitting Pretty’ so you can see what I would wear them with in a Spring/Summer look. 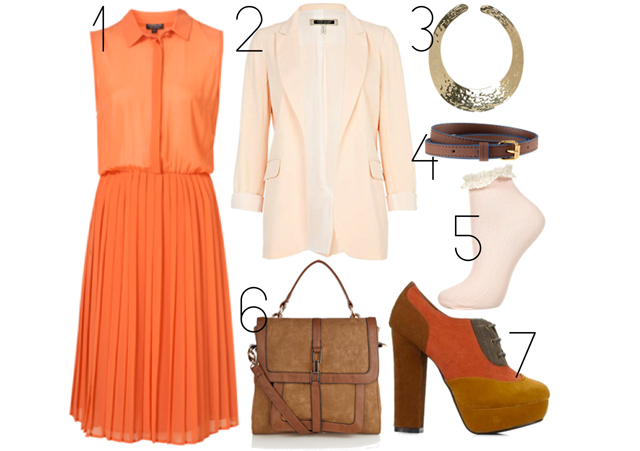 The peachy orange dress brings out the colours of the shoes perfectly, and the muted jacket and frilled ankle socks add a girly twist. I’m really into collar/cuff necklaces at the minute, and this gold one ties in well with the shades of the shoes. The belt and the bag pull everything together for a playful yet chic look, perfect for day or night! Do the Jeri platforms float your boat? What are your favourite shoes on Sarenza? "HOME INSPIRATION – LIVING ROOM"
Oh these are just gorgeous, especially with those socks you've picked out! I loved little frill socks when I was at school, and still do. I want to wear that outfit right now. Mmm, they are so pretty!